"En 10 años de servicio nunca he visto una tontería igual." - In ten years of service, never have I seen such foolishness. So said the local policeman last Sunday at Madrid's Londonize event. Of course, every London market has Beefeaters in full costume guarding the gates and every stallholder is happy to haggle in exaggerated cockney accents with each customer. This applies only to every London market in Madrid. At Londonize, Madrileños were overjoyed at the prospect of shopping in an almost-convincing recreated Camden Market and Portbello Road around Plaza de la Paja and many queued for hours to gain entry into the Beefeater Gin sponsored event. While Londoners happily join the crush of credit card wielding shoppers crowding around the Spanish charcuterie stands of Brindisa in Borough Market for a few expensive scraps of chorizo and jamon Iberico, it seems the Madrid equivalent is about 10,000 hip young things battling for the chance to buy West Indian incense sticks, Peruvian knitted caps and plastic policemen's helmets from a stall draped in Indian throws. No Spanish traders were present as all stallholders were invited from the UK only; Camden and Portobello regulars were there to sell their wares to the muy entusiasta Madrileños and items such as cricket bats, rugby balls, handmade jewellery, antiques, Bob Dylan vinyl records and foodstuffs such as strawberries 'n' cream and fish 'n' chips were priced up but lapped up. It particularly tickled us to picture the many Spanish speakers learning how to haggle with stallholders in English in specially organised three-minute sessions. There was also a 10 per cent discount available to those who exchanged Euros for Sterling and did their shopping with pound coins, fivers and tenners. The traditional Madrileño approach to anything that is remotely amusing, involves crowds, food, music and spending is to do with it gusto and last Sunday's event, despite the 27 degree heat and interminable queues to get in drew the right crowd, as organiser Pace Recuero noted: "Todos somos un poco fashion victims". Well, they got that bit right at least. 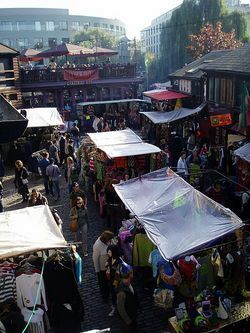 Image Camden Market by Garretkeogh via the Londonist Flickr Pool under the Creative Commons Deed.